Several of us attempted to capture the dim interior of 1221 on film, but Vince was a master of it. He discovered that Ilford HPS film was far superior in shadow speed to the more familiar Kodak Tri-X, even when the latter was encouraged with Accufine and other exotic brews. For some reason, none of us can locate most of our 1221 photos, but here are the ones that Vince has found so far. Each one can be clicked to see a larger version. Unbeknownst to many of us at the time, Vince also documented part of the 1221 neighborhood in watercolor paintings. © 1961-2004 by Vince Cottone. May be reproduced only with written permission from the author. 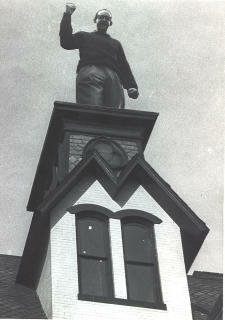 Without revealing his nefarious purpose, Vince persuaded Howie Mitchell to pose standing on the teachers' desk in the OSH (the science classroom, otherwise known as the "Old Study Hall"). Vince pasted up a collage, placing Howie on the tower with a lightning bolt in his right hand. Unfortunately, the lightning bolt detached itself before this scan was made, but Vince plans to restore it. As befits anyone hurtling lightning bolts, Howie is shown somewhat larger than life size. A simulated view of the 1221 tower from approximately the same vantage point, generated with Virtual 1221. 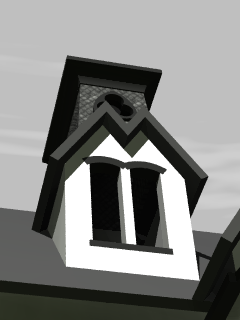 Comparison shows that the upper tower (the part covered with slate) needs to be widened slightly and equipped with corner trim and side windows in order to match the photograph. The attentive viewer may notice other minor discrepancies. Comparison with photos is the primary method of improving Virtual 1221. 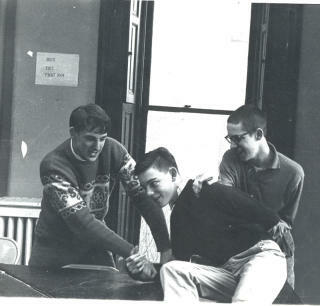 Jim Hagen, John Mason, and Doug Hamilton experiment with force, mass, and inertia, circa 1961. The southeast window of the parlor in the background shows the interior shutters. 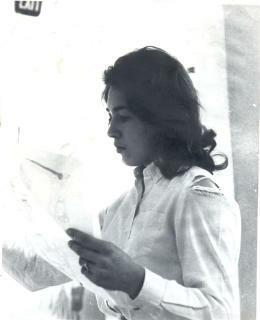 Sue Harris during a reflective moment somewhere at 1221, possibly in the OSH. 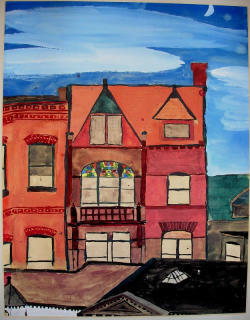 Vince painted this evocative view of the neighborhood from the tower of 1221, looking north toward M Street. It would be interesting to know whether any of the buildings shown still exist.